I wanted to share a day’s worth of pictures/videos as a glimpse into my classroom. We start everyday with a student produced wordle for our version of ‘Guess the Wordle”. The students have recently started dedicating them to each other. This was today’s Guess the Wordle. View more presentations from skrtic. 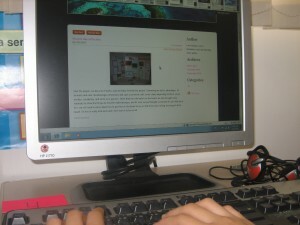 We then quickly checked in with our blogs on weebly. The students are reflecting on their Project Day Presentations. Before break, students had time to check in with their assignments on Mathletics and play a few live games. Untitled from Sharyn Skrtic on Vimeo. 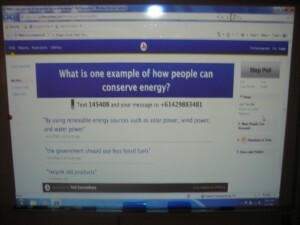 After break the students came back in to find a question up waiting for responses using polleverywhere.com. This was their first time submitting feedback and watching as all of their ideas appear on the screen. The question of “Can we submit more than one? !” came quickly! 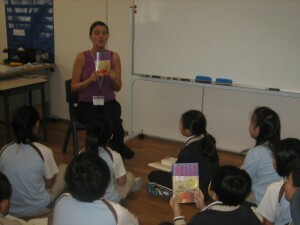 Before lunch we had a little wrapping up to do with our novel, Holes. We were identifying examples of irony from the novel. After lunch the students had full stomachs and were ready to relax and begin watching the movie, Holes. It was a busy Tuesday, but the students accomplished a lot! This entry was posted in integration, Math, Reading, writing. Bookmark the permalink.